I refer to my last week at work as the “Murphy and Ruska Show” in honor of two delightful patients who arrived at my doorstep one day apart, each with a life-threatening disorder called pneumothorax. “Pneumo” means air and “thorax” refers to the chest cavity, so “pneumothorax” is air within the chest cavity. If you’re scratching your head wondering, “Isn’t there supposed to be air in the chest cavity?” here’s what you need to know. While the lungs are air-filled, the space surrounding the lungs, known as the pleural space, is normally devoid of air. Pneumothorax refers to the accumulation of air with the pleural space. In order to understand how a pneumothorax causes difficulty breathing, it helps to think of the chest cavity as an empty barrel into which the lung lobes expand as they inflate (like balloons filling with air). The lungs readily inflate with minimal effort because negative pressure (a vacuum effect) normally exists within the pleural space. Fill the pleural space with air and the negative pressure is disrupted resulting in more effort required for lung expansion. Make sense? Murphy and Ruska were both observed by their families to experience an abrupt onset of labored breathing. Murphy also became subdued, a marked deviation from his normal wiggly-waggly Labrador self and he was unwilling to lie down. Clever Murphy figured out that lying down makes labored breathing even more of a struggle. In addition to working extra hard to breathe the normally ravenous Ruska refused her breakfast, a sure sign that this sweet Shepherd was off her game. The two most common causes of pneumothorax are penetrating chest cavity wounds that allow external air to enter the pleural space and leakage of air from the surface of a diseased or injured lung lobe. 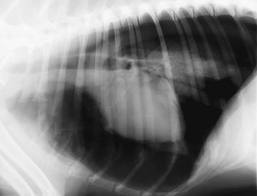 Pneumothorax is readily diagnosed with a chest x-ray. Have a look at the accompanying normal and abnormal x-ray images. In both views, the dogs are lying on their sides with their head end to the left and their tail end to the right. You can see the spines at the top of the images. Note the heart, the whitish round structure in the middle of the chest cavity. 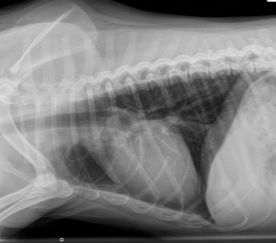 Air shows up black on an x-ray. Now notice how much more black (air) there is surrounding the heart in the pneumothorax image compared to the normal chest. Makes you want to become a radiologist, eh! Murphy and Ruska were referred to me to figure out why they had leaky lung lobes. The most common cause of pneumothorax is a blunt blow to the chest cavity (hit-by-car trauma is classic) forceful enough to tear a lung lobe and allow leakage of air into the pleural space. Ruska and Murphy were both closely supervised with no known trauma history. Computed tomography (CT scanning) is my test of choice for solving the mystery of the leaky lung lobe. Murphy’s scan revealed multiple small blisters (aka, blebs or bullae) on his lung lobe surfaces. Just as in people with this abnormality the blisters are thin-walled and capable of spontaneous rupture allowing air to leak into the pleural space. Fortunately, as was the case with Murphy, most lung blisters are self-sealing within a few days. Worse case scenario, a stubborn leaker can be surgically sealed. Murphy’s family has been forewarned that his multiple blebs will likely mean multiple pneumothorax episodes. They know what to be watching for and will return with Murphy any time, day or night, should his labored breathing recur. Murphy is now home, happy as can be with instructions to be a couch potato for the next two weeks with hopes of avoiding disruption of the body’s “bandaid” on his leaky lung blister. Ruska’s CT scan documented a small walled off abscess on the surface of one lung lobe. Given the time of year and where Ruska lives and plays, I’d be willing to bet my first born child that a foxtail plant awn is living within that abscess. Fortunately, Ruska’s lung lobe leak resolved itself, and the pros and cons of surgically exploring the site versus long-term antibiotic therapy (foxtails shuttle bacteria wherever they migrate) were discussed and are still being considered. I should be hearing back from Ruska’s mom sometime this week. For now, this big girl is back home and, like her friend Murphy, she is doing her best to be a cooperative couch potato (easier for a Shepherd than a Lab!). Our emergency room vets are used to seeing pneumothorax patients because car trauma is so prevalent. As a small animal internist I rarely see them, yet here were two within one week! This article is shared with permission from Dr. Nancy Kay, DVM, Diplomate, American College of Veterinary Internal Medicine and author of Speaking for Spot: Be the Advocate Your Dog Needs to Live a Happy, Healthy, Longer Life. Comments and feedback are welcomed on Dr. Kay's original blog post.